We’ve been together for a long time now. You’ve stayed with me through the good times as well as the bad — from Thanksgiving dinners to food fights — and you’ve comforted me in ways that only a big bowl of starchy carbs can. But, I’m older now — and more experienced. I’ve tried other potatoes and I think it’s time for us to go our separate ways. Don’t get me wrong — I DO like you. It’s just that I have to add like an entire stick of butter, tons of garlic, and a heaping handful of grated cheese to really enjoy all of the things that you have to offer. Some people say that when you get comfortable in a relationship you get lazy. Maybe they’re right — I’m definitely looking for something low-maintenance, something that just ‘works’ without a lot of effort. When you and I first met, I invested a lot of time into understanding you — I would ask myself questions like, ‘ should I slice the potatoes before I cook them or should I boil them whole?’ or ‘what’s the best tool for mashing the potatoes without overworking them?’ But the more I get to know you, the more I wonder whether all of this special attention is worth it. 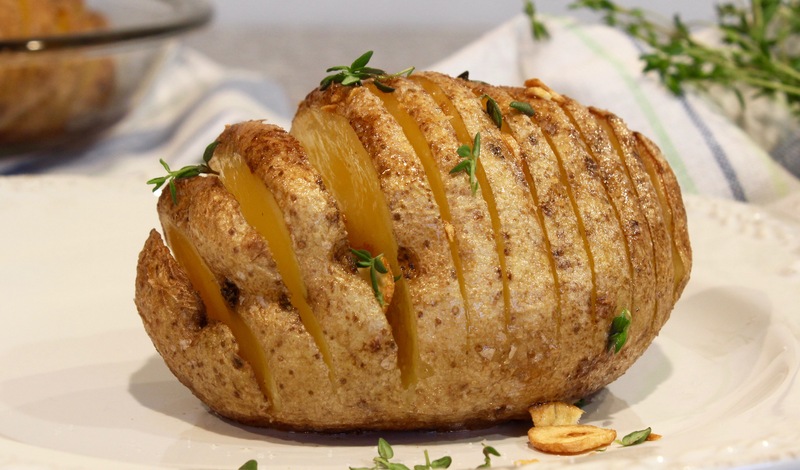 You probably already know this but you deserve to hear it directly from me; I’ve been flirting with the Hasselback potato and it’s starting to get serious. 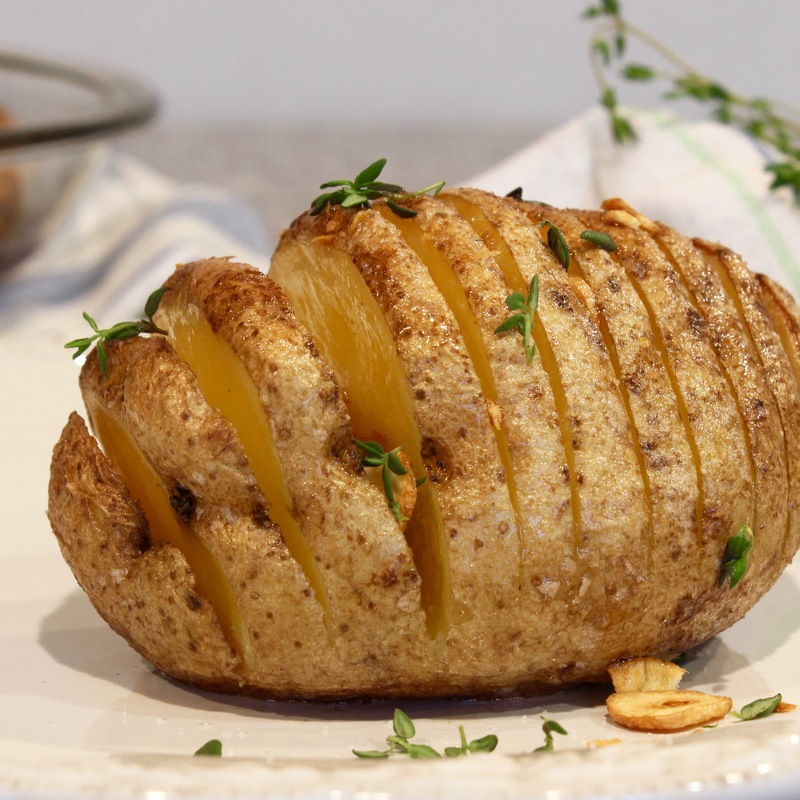 The Hasselback potato has everything that I’ve been looking for: ease of preparation, a rich flavor that comes from roasting, and a creamy, soft center hidden away underneath a fan of crispy edges. All I have to do is slice the potato, brush it with butter, sprinkle it with salt, and pop it into the oven. What comes out an hour later is sheer perfection. I do have to thank you, though; if you weren’t so bland and easily made gummy I would have never had the courage to seek out other potatoes. Ironically, I owe my new-found happiness to you, Mashy. I know that the timing of this breakup isn’t great (right before a major holiday and all) but I hope that you will take comfort in knowing that it’s not you — it’s me. I hope that we can still be friends. Maybe even see each other once in a while… for old times’ sake. Preheat the oven to 425 degrees Fahrenheit. Wash the potatoes and pat them dry with a clean towel. Make evenly spaced slices in the potatoes without cutting all the way through them. Then, brush the potatoes with melted butter on all sides (including the bottom). Use a pastry brush to spread butter into each of the slits in the potatoes. Sprinkle the potatoes with salt and place them in a baking dish. Meanwhile, heat the olive oil in a pan. When the oil starts to shimmer, add the sliced garlic and fry until golden brown. Drain the garlic on a paper towel. After the potatoes have baked for 30 minutes, brush them with the remaining butter. Sprinkle more salt on the potatoes and return them to the oven. Bake the potatoes for another 15-30 minutes, depending on their size. 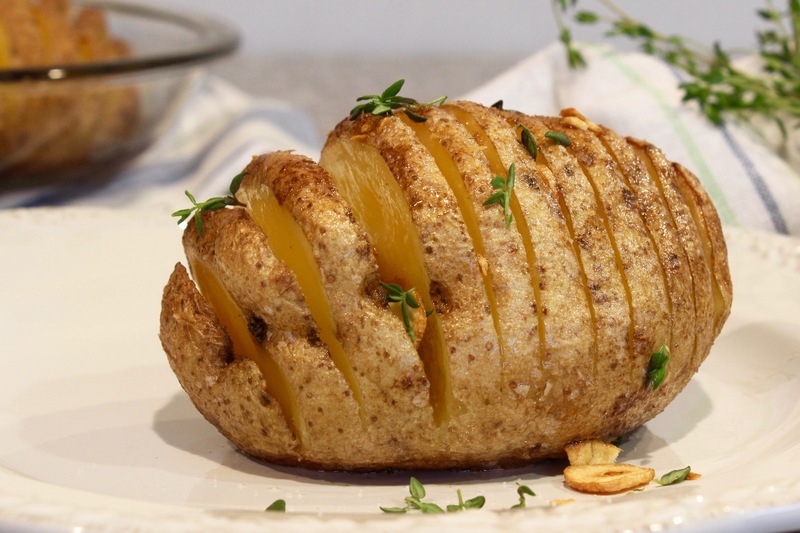 The potatoes are done when they are tender in the center and the slices are crisp and browned. Serve the potatoes immediately, topped with a pat of butter (optional), fried garlic slices, and fresh thyme leaves.